I'm occasionally perplexed by my own gaming habits. During the past few years I've found myself setting aside or even foregoing certain games I've had every reason to enjoy. Even worse, I've occasionally spent hours on games that would normally bore me. It wasn't until the Call of Duty 4 multiplayer beta that I could put my finger on what was up. I wasn't overly excited when I received a COD 4 multiplayer beta invite last month. 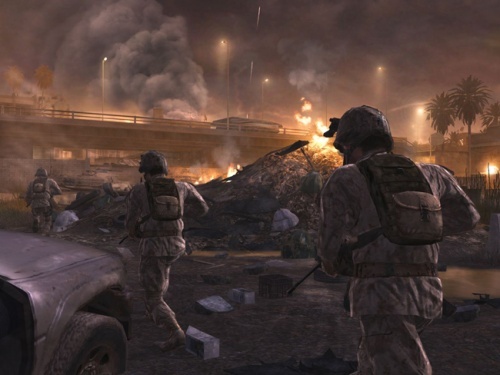 Though I'm an Infinity Ward enthusiast, and I thoroughly enjoyed the single-player campaigns of both Call of Duty and Call of Duty 2, the series' multiplayer components never drew me in. The beta languished on my 360's hard drive for nearly a week before I checked it out. Once I started playing, I couldn't stop. On the surface it was just another well-built multiplayer shooting gallery, exactly what I expected from the franchise. There was an unexpected new layer to the combat, though: a kill- and experience-based ranking system, built atop the conventional multiplayer game, which offered a robust set of rewards. Every time I took an enemy down, I earned points toward a new rank. Every time I achieved a new rank, I unlocked new weapons, equipment or abilities. And each new unlock gave me a slightly new way to play. The game even displayed player progress with a horizontal bar at the bottom of the screen that, in classic RPG fashion, inched ever forward toward the next rank. Each successful kill actually broadcast its value via an experience number that flashed for an instant above the downed enemy. Ranking up even triggered an immediate in-game notification, complete with cool visual and audio effects. I kept at the COD 4 multiplayer beta for two weeks solid, cycling through the same three maps, eagerly working my way toward higher ranks, improved weapons and more useful perks. When I finally set it aside, it wasn't because I'd become bored of its steady stream of rewards, I just couldn't bear earning more accomplishments that would be erased when the beta closed. In retrospect, I shouldn't have been surprised by how taken I was by the game's system of ranks and unlockables. After all, it was the same press-lever-receive-treat mechanic that drove me (and millions of others) to sink countless hours into games like World of Warcraft. It didn't matter that I was headshotting insurgents instead of hacking murlocs. The reward function and its effect were the same.